If you’re thinking of buying a boat, you can learn a lot surfing the Internet, where an abundance of pictures, videos and statistics awaits. 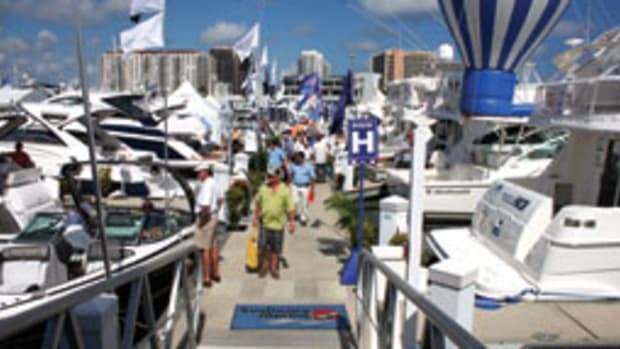 But you’ll still want to inspect boats in person — stand at the helm, stretch out in the bunks, stick your head in the bilge — and the best place to do that is at a boat show. Now is the time to buy, says George Sass, an occasional writer for Soundings. 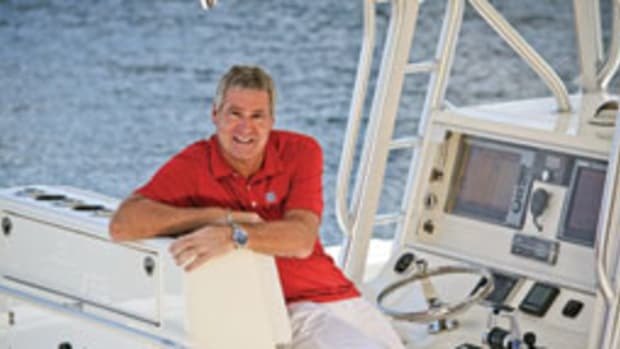 Sass has worked both sides of the boat show dock — as an avid boater and as a marketing consultant for boatbuilders and equipment manufacturers. Builders and dealers are anxious to sell, especially last year’s boats, which they need to move to avoid bank finance charges, Sass says. “Many of these 2010 or even 2009 models are no different than 2011 models,” he says. Smaller, semicustom or custom builders are more willing to accommodate special requests simply because they need to keep their production lines open, Sass says. And don’t rule out the builders and dealers that aren’t exhibiting at the show. “These economic times are very difficult, and some very good builders may simply elect not to spend the money [on] shows,” he says. 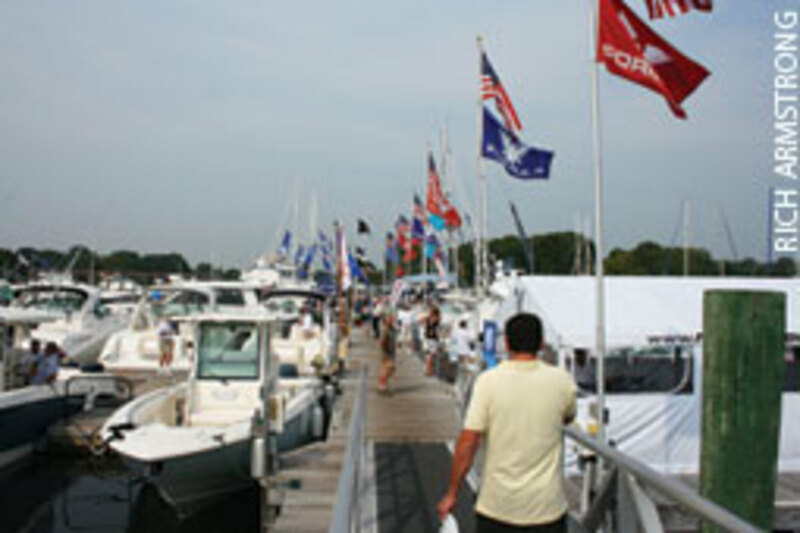 Brokerage firms often set up “side shows” near the actual boat show. “Maybe that brand-new model is beyond your budget, but a lightly used model might be right around the corner,” says Sass, who has attended nearly every major U.S. boat show. I’ve covered the major shows for marine publications for nearly 16 years. An eight-year stint as editor of Powerboat Reports taught me how to identify quality boats, question knowledgeable salespeople and collect key data to formulate reviews and recommendations. I teamed up with Sass to offer some boat show tips. • Try to attend shows on a weekday to avoid the weekend crowds. You’re more likely to meet a company’s top dogs on a Thursday or Friday because they usually come in for trade/media day and to oversee the setup. • Familiarize yourself with the show’s layout and map out a route for the day to avoid aimlessly searching for a particular boat, engine or accessory. • It’ll be a long day, so wear supportive and comfortable shoes, drink lots of water and take breaks. There’s no better place to sit than aboard one of the boats you’re inspecting. I like to sit in the companion seat at the dinette and listen to the comments people make about the boat as they shuffle through. You can get some insightful opinions. • Some boatbuilders ask you to remove your shoes before boarding, so slip-ons are a good idea. • Avoid collecting too many brochures. It’ll slow you down. Get as much electronic media as you can (thumb drives, etc. ), or just round up business cards and check out the specs online later. Use a camera or smart phone to take photos, and bring a notepad. 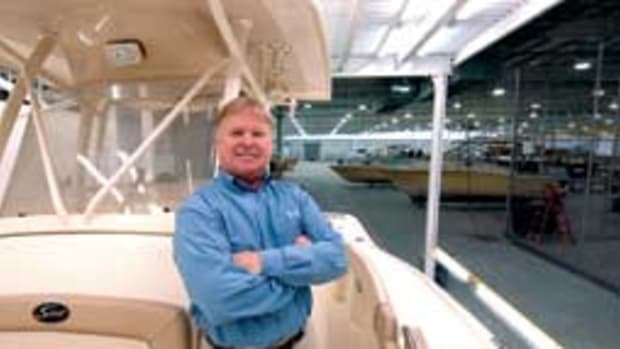 • Recognize that many people working these shows know nothing about boats, such as the attractive women greeting you at the entrance to the display area. 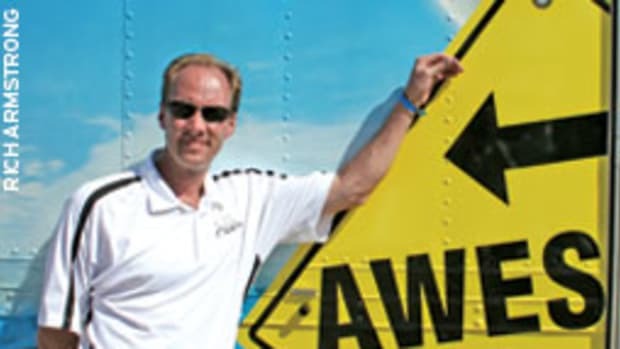 • Watch out for what I call “boat show blunders” — piles of fiberglass dust in the storage compartments, sloppy wiring installations, even puddles of oil or hydraulic fluid in the bilge. These can reflect the overall quality of the product and the builder’s or dealer’s level of care. • Assess the caliber of people on the demo boat or in the booth. “Allowing temporary or low-level help to try and answer questions about a $500,000 yacht or $7,500 radar isn’t the way to make a good impression,” Sass says. • If you’re looking to buy a boat, do some preshow homework. 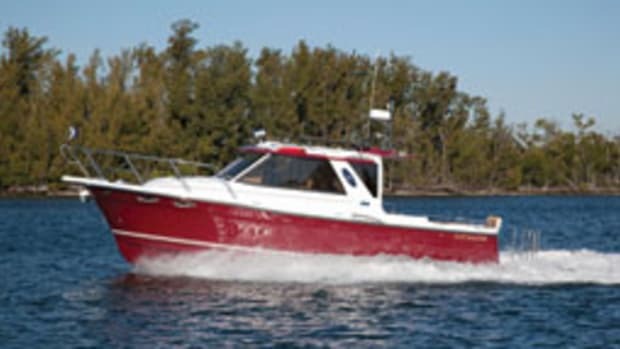 Familiarize yourself with the prices of the boats you’re interested in. An increasing number of builders offer online tools to choose options and calculate costs. Or seek out brokerage websites. • Prior to the show, try to schedule an appointment with a dealer or builder for a private walkthrough. • Make a list of questions, or even a chart, to record which boats have the features and qualities you want. • Know the basics about construction, design and propulsion so you can ask pertinent questions. A builder or dealer should be capable of answering these types of questions: Is this boat built with vinylester or polyester resin? Is the hull a deep-vee or a modified-vee? What is the fuel consumption in gallons per hour? If the salesperson knows little about these topics, find someone who’s better qualified. 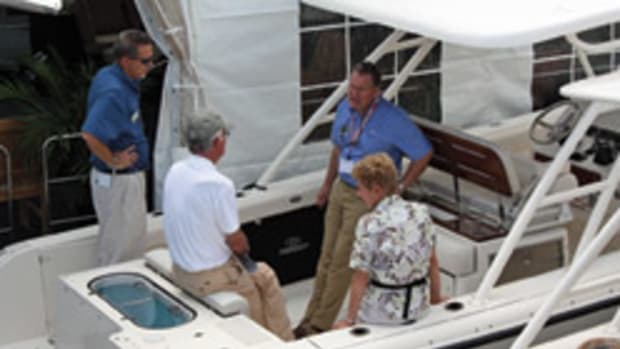 • Make sure the boatbuilder or dealer can arrange for a sea trial. Never buy a boat before driving it, preferably in rough conditions. 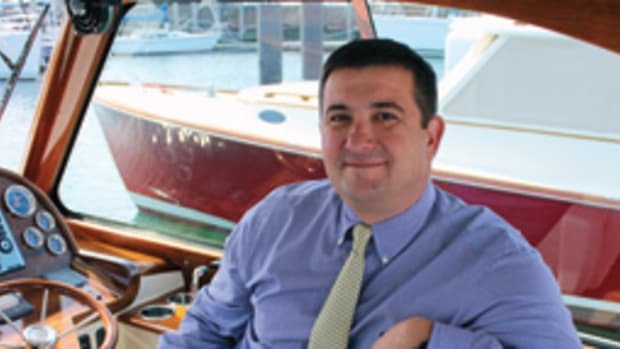 Talkin' Boats with Michael Arieta executive vice president of The Hinckley Co.